Former Utilities Director Rick Romero helped create the city's revolutionary plan to improve the streets, clean up the river and save money. When summer hit this year, holes opened up all across downtown Spokane. Not the sort of potholes that have been local humorists' punch lines for decades — but knee-deep craters, full of chunks of concrete rubble and mountains of dirt, as backhoes went to work across the downtown core. 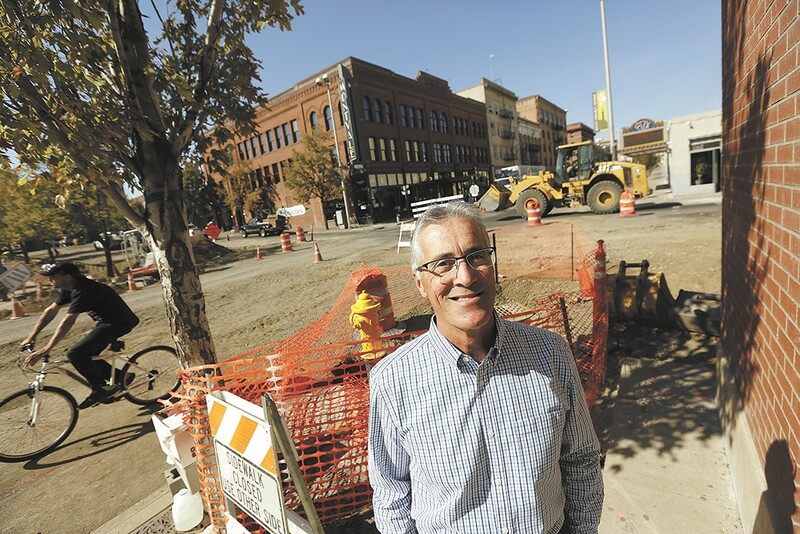 The construction may have frustrated downtown businesses and motorists, but for city leaders like Chief Financial Officer Gavin Cooley, it represents one of Spokane's biggest successes in the past decade. These holes downtown are the product of a revolutionary policy shift that impacts not just the streets, but the river and the parks as well. For decades, many of Spokane's major arterials have been in shoddy shape, plagued by ruts, buckles, fissures, potholes, and so many interwoven cracks there's a word for it — "alligatoring" — named after the way a damaged street can resemble the reptile's skin. Now, from Cooley's perspective, the city is on the road to fixing all that, and keeping it fixed. In other words: the notorious Spokane pothole problem? "I think we've beaten it," Cooley says. Potholes are just a symptom, says former Utilities Director Rick Romero. A poorly funded street system — that's the disease. For years, the city had been in triage mode, rushing around filling potholes and patching cracks, but putting off the sort of maintenance that would prevent more from forming. In part, blame a tax-wary public: The voters had passed a street bond in 1987, but then rejected one in 1996 and — despite facing a $180 million backlog in street repairs — rejected another in 2002. It took conservative Mayor Jim West to buck the trend in 2004, winning over skeptical voters by going deep into specifics of how the bond would be used. He got a $117 million bond passed, but that still wasn't enough to eliminate the backlog of deferred maintenance. In 2011, the city council began charging $20 car tab fees to create the Transportation Benefit District to pay for neighborhood street maintenance, repairing roads with chip seals and fixing more serious problems by grinding off the top layer and replacing it. When Mayor David Condon took office the next year, however, the first problem he was focused on wasn't fixing the streets. In fact, he'd used the TBD as a bludgeon against his opponent, former Mayor Mary Verner, for approving the fee increase. It was his effort to solve the city's stormwater problem, Romero says, that set the city on the course to solving its streets problem. When heavy rain hits asphalt, it sends a torrent of dirty water full of pollutants flooding into the city pipes. Cities can handle this problem by dumping the dirty water into the river, damaging the environment. Or they can channel the dirty water to a treatment plant — but building one that can handle all the stormwater surges is expensive. That's where Combined Sewer Overflow tanks come in — big concrete boxes that store surging stormwater until the storm dies down, allowing wastewater treatment plants to process the excess at a more reasonable pace. But with the city still limping financially from the recession, Romero says, Condon was looking at the possibility of spending $300 million to $350 million on massive new CSO tanks. "That's the way it was being cast: Either you could be environmentally responsible and spend $300 million, or be financially responsible and don't do anything," Romero says. But he says it was a choice Condon wasn't willing to settle for. There was a third way: Turn the streets themselves into stormwater solutions. Rebuild them to channel water into trenches along the sides or center of the road, and fill those trenches with grasses, gardens and trees atop specially engineered soil. Instead of rainwater draining from the blacktop into city pipes, it would soak slowly through the grass and the soil — being filtered without ever entering a treatment facility. "We're mimicking what nature does to remove pollutants," says Marlene Feist, city utilities spokeswoman. But to do that meant marrying the utilities and streets departments, Romero says. With the departments split up into fiefdoms, such an arranged marriage wasn't a simple task. "What you had going on, quite frankly, was a lot of department directors who saw their primary job as protecting the department's own goal," Romero says. "We had to figure out how to erase those boundaries." It wasn't just a managerial riddle, it was a financial one: The city had to create a system to legally allow utilities (which pays for itself through fees) to transfer money to streets. Feist brought community members on board, working with environmental activists, local tribal governments and the state Department of Ecology to develop the plan. "We are steering change that will serve us for generations," Condon wrote in a statement. In May of 2014, the city council approved the Integrated Clean Water Plan unanimously, heaping kudos on the city staff and leadership, noting all the roadblocks they had busted through. Former Councilman Mike Allen called the plan one of the most "simple and innovative things" he'd seen in government. Ultimately the city calculated it would save $150 million on CSO tanks — allowing Condon to put $100 million of that toward repairing streets. It came just in time: West's street bond had come with a catch — the bonds would last for 20 years, but would only pay for 10 years of street construction. By funneling utilities savings into streets and refinancing the bond with cheaper interest rates, it meant the city could pass a levy for street projects until 2034 and a bond to improve Riverfront Park — all without raising taxes. And because of the way the 2014 levy was structured, the city will have more and more to spend on street maintenance with each passing year. Potholes will never go extinct, but they will be much more rare. "That's the snowball rolling downhill instead of uphill," says Cooley. As the backhoes and jackhammers tore up the pavement downtown, what city workers found beneath hammered home the awful conditions of many of Spokane's roads. On some streets, the wood from old railway ties and streetcar lines had rotted away, leaving space for water to collect, freeze and cause damage. In other spots, the asphalt had simply been poured over brick. In some places, the pavement was only 2 inches thick. Feist shows an illustration of the new street design: 6 inches of pavement atop 9 inches of packed gravel mix for stability. From the top and the bottom, it resists the sort of damage that could create potholes. In the past few months, City Council President Ben Stuckart says, he hasn't been hearing many pothole complaints. "Right now I'm getting more complaints that downtown is a mess because of street construction," Stuckart says. "Hell, we're probably tearing up too many streets." It's a tension that city staff is aware of: There's only so much street work you can do at any given time without it having an unacceptable impact on businesses and transportation. The new street repair strategy exacerbates that issue by increasing the time it takes to replace a road: Instead of tearing up the street once to fix the pavement, then tearing it up again every time the city needs to fix pipes or other utilities, the city now does all of its streets and utilities work in one go. Not only does combining street work and utility work save money, it's an additional weapon against potholes. Each time you pierce the pavement to fix some pipes, says Feist, you leave a scar. Water seeps into that scar, and when it freezes, it can create a pothole. In other words, break the pavement less often and prevent more potholes. Romero, now retired, is confident that the city's streets strategy has been set on a path that guarantees positive results for years to come. The city has further integrated its departments. The new Public Works Division, led by Scott Simmons, officially puts utilities, streets and engineering services under one umbrella. Recently, Simmons says, the city of Spokane hasn't had the same sort of flashy, large-scale innovation as the city's Integrated Clean Water Plan. Part of that is intentional. "If we allowed the mayor to continue doing what he does really well, he would continue to challenge and find innovations. We had to say, a little bit, 'Let us execute,'" Simmons says. "We are really in execution mode." Innovation isn't being stifled, he says. It's happening in smaller, specific ways. All over, the city is finding ways to double the value of projects. On Havana Street, the city is building bike lanes with porous asphalt designed for stormwater to soak through, reducing stormwater runoff, and eliminating the sort of ice that busts up pavement and turns bike lanes slippery. On Sprague Avenue, street renovations are being coupled with streetscape improvements, like pedestrian lighting and curb bump-outs. As the city builds its CSO tanks, it's planning green spaces, parking spots or public plazas atop the underground tanks. Romero is concerned about the degree to which bold innovation is possible in the current climate. He was a member of the joint committee overseeing the recent independent investigation into how the city handled allegations about former police Chief Frank Straub. As words like "liar," "toxic," "bully" and "politically motivated" have been lobbed, Romero has seen how the relationship between the city council and city administration has suffered. "I can guarantee you, if we had this current environment and culture that we have right now, none of this [innovation] would have happened," Romero says. "The cost and consequence of government's dysfunction is losing the ability to do things like this that involve risk and trust and collaboration." Stuckart dismisses such criticism as coming from "negative nellies." "Jesus, there are lots of ways to integrate and work together," Stuckart says. "We're working on a ton of different economic development projects, all over the city." Even Cooley, despite all his optimism about the city's direction, agrees with Romero.